Direct link to the "Table 2" above. "FII" is the food insulin index for each type of food tested. In my post "Obesity Is Always and Everywhere an Insulin Phenomenon" I explain why insulin is so central to obesity. In brief, among its many other effects insulin is an instruction to fat cells to take in blood sugar and turn it into stored fat. As a result, knowing the details of what ramps up your body's insulin production is much more helpful for weight loss than counting calories. The Problem with Calories In/Calories Out. But isn't it obvious that weight-loss is all about calories in/calories out, given the familiar energy balance identity below? The basic problem with that view is in the title of my storify story "How the Calories In/Calories Out Theory Obscures the Endogeneity of Calories In and Out to Subjective Hunger and Energy." To understand weight-loss or weight gain from the energy balance identity, you have to understand calories consumed and calories expended. And insulin is the key to understanding calories consumed and calories expended. As mentioned above, high insulin levels cause sugar to be taken out of the bloodstream and turned into fat in the fat cells. The low blood sugar levels then have two effects: making you hungry, so you want to eat more, and making you feel less energetic, so you burn fewer calories. Some aspects of a low-insulin strategy for weight loss will look very similar to what you might try to do anyway under the naive take on calories in/calories out that surrounds us in our culture: for example, eat lots of greens, avoid anything with added sugar; avoid eating late at night. But many other aspects of a low-insulin strategy are quite different than the conventional wisdom. What I think is the correct advice—and hope will become conventional wisdom in a better future—is to avoid all foods and beverages that cause the body to produce a lot of insulin and to lean towards foods and beverages that cause the body to produce relatively little insulin. This post looks at the evidence on which foods and beverages cause the body to produce a lot of insulin and which don't in order to give advice about what are healthy and unhealthy foods to eat in relation to weight gain and weight loss and the suite of "Western diseases" such as diabetes, heart disease and strokes that are highly correlated with weight gain and weight loss. Multipliers. "Table 2" linked above (from the paper linked above that) reports the results of experiments in which experimental subjects ate a particular food, and then their insulin was measured over a period of time after that. The table focuses on differences between different foods and beverages. But there are also difference across people and across time in insulin production. Compared to other people, you will produce more insulin in response to any given food or beverage if you are "insulin resistant." Basically, if you have had chronically high insulin levels, some cells in your body are likely to respond less to insulin, and so your body produces more insulin. It is a little like people who have hurt their hearing through many years of loud music; because they can't hear as well, they often turn up the volume of the music even more to make up for the lost hearing. The bottom line is that the more you have acted to raise you insulin levels in the past and the less you have done to lower your insulin levels in the past, the more insulin any given food is likely to cause your body to produce now. ... is there a difference between eating during the day and eating at night? Well, the studies are few, but perhaps revealing. In a 2013 study, two groups of overweight women were randomly assigned to eat a large breakfast or a large dinner. Both ate 1400 calories per day; only the timing of the largest meal was changed. The breakfast group lost far more weight than the dinner group. Why? Despite following similar diets and eating about the same amount, the dinner group had a much larger overall rise in insulin. An earlier 1992 study showed similar results. In response to the same meal given either early or late in the day, the insulin response was 25 to 50 percent greater in the evening. Insulin production being high late in the day has a very obvious implication for weight loss: if you can, make your big meal of the day lunch, not dinner. For most people this is possible at least on the weekends. Actually, as far as timing goes, a big breakfast is likely as good, maybe even better, but as I will discuss below, many common breakfast foods are particularly high in their insulin production, so it might need to be a big breakfast that doesn't look like breakfast food to you. So suggesting that lunch be the big meal might lead to less misunderstanding. Insulin index below 10: suitable for eating and drinking even on an extended "modified fast." Also, for comparison, straight sugar (glucose) has an insulin index of 100. For simplicity, I will report only the point estimate of the insulin index for a food or beverage. Table 2 at the link reports standard errors. You should double those to get an idea of a reasonable range of what could be true. In particular, if you think one of the insulin index ratings doesn't make any sense, it is fair to look up the standard errors in the table, then add double the standard error and subtract double the standard error to get a reasonable range of what the true insulin index might be for that food. It is especially valuable to be suspicious of the point estimate of an insulin index and pay close attention the confidence interval obtained by looking at plus or minus 2 standard errors when the insulin indexes for similar foods seem very different than the insulin index for the food you are looking at. I do a bit of that below. From here on, I will list only the highest-fat versions of things in the table since eating lowfat versions of things makes no sense unless you want to fool yourself that you are eating more healthily than you are. The trouble with sweet beverages is that the sugar in them is too easily and quickly digested, and so causes and insulin spike. That includes fruit juices. The fiber in fruit is needed to slow down digestion and moderate the insulin spike. Making fruit into juice stops the fiber from doing its work. Even beverages with artificial sweeteners can cause an insulin spike simply from a mental anticipation effect: it is easy for your body to start looking forward to some real food if you taste something sweet. Some artificial sweeteners have other effects on insulin, but for those that operate through a mental anticipation ("cephalic") channel, my view is that they are more OK when sprinkled on real food than when drunk as part of a "zero calorie beverage" which makes the body expect nourishment that won't actually be there. If you want to know about the effects of a particular non-sugar sweetener on insulin, try googling "insulin [name of non-sugar sweetener]" and you might find articles like this on the effects of stevia and aspartame on insulin. This one is pretty obvious. One more lenient rule of thumb is to avoid anything with any form of sugar listed among the top three ingredients. The body can turn starch into sugar so fast that starches cause insulin spikes similar to sugar itself. But in case it is not so obvious what is a starchy food, I list them all in the category for the appropriate insulin index range. For other health reasons, I am not going to recommend drinking alcohol. (The idea that alcohol is good for health doesn't replicate well, empirically.) But it is worth knowing that while beer has an OK insulin index of 20, white wine has an insulin index of only 3. (Gin has an even lower insulin index of 1, but such high levels of alcohol have other negative side effects for health that have nothing to do with insulin.) Because grapes have a relatively high insulin index, I suspect that red wine, which leaves more of the grape in has quite a bit higher insulin index than white wine. Indeed, I wouldn't be surprised if the insulin index for red wine is in the same ballpark as for beer. Given this principle, of alcoholic beverages I will only list white wine below. On to the groupings. Note that many foods and beverages haven't been tested, so one has to guess based on the things that have been tested. One good example is what I said about cold cereal above. I'll bet cold cereals that haven't been tested have quite a high insulin index, too! (Below I will leave cold cereals out, since I dealt with them all I need to above.) Remember to choose the highest-fat version of everything available. Lowfat versions of things will have a higher insulin index than what I list below! Website for buying Panjacks—but don't buy any! In addition to keeping portion sizes small, make sure to combine things in this category with other things that have a lower insulin index. Try not to eat them all by themselves. If you are on any medication, you need to talk to your doctor before trying an extended fast, because appropriate dosages are often affected by how much you are eating. If you are diabetic and don't have your doctor adjust your diabetes medicine for the fact that you are eating less for a period of time, you could die. Here, what I want to suggest is that for those who don't tolerate extended fasts (lasting more than a day) very well, it might work well to have a week, say, in which you only eat very-low-insulin-index foods. To my mind, that is too little variety to be a satisfying diet all the time, but if you think of it as a modified fast, a week of very restricted food choices wouldn't be that bad if you then go back to eating a wide variety of things. Here, I will list the things there is data on, then I will give my best guess about a wider range of things I suspect would have an insulin index below 10. Let me note this: I assume the bacon in the list just below is bacon with no sugar added. Unfortunately, in the US, most bacon does have sugar added. You have to work hard to find bacon without sugar added and then pay extra. Bacon with sugar added likely has an insulin index quite a bit higher than 9. You may not always feel it is worth the extra money for bacon with no sugar added, but I would make a point of getting bacon with no sugar added for your modified fast, if you are going to eat bacon during your modified fast. This list means that you can have a very nice kale salad with bacon, avocado, olive oil, low-carb dressing and pine nuts, with a side of other nuts. And you can have "bulletproof coffee" which is butter melted into coffee, or stick with just cream in your coffee or tea. That doesn't sound so bad if it is only for a week. It should go without saying that if you like these foods, it is great to eat them all the time—don't limit them to modified fasts. Part of my own practice is to make sure to eat a gigantic salad every day. That daily salad has a few other things in it, for example a tomato, mushrooms and half a cucumber, two eggs instead of bacon, and usually lettuce and spinach instead of kale, but it includes many things in this "insulin index so low it is suitable for a modified fast" category, including a whole avocado every day, pine nuts and all three of hummus, oil (olive oil or MCT oil) and full-fat 1-gram-carb ranch dressing. Preparing food causes an anticipatory rise in insulin, which makes me hungry, so I eat handfuls of roasted cashews and almonds and raw brazil nuts and salted raw macadamia nuts while I am preparing my salad. In any case, be careful. Different people have different experiences, and because a lot of nutritional research has been barking up the wrong tree, research on fasting in general and on individual differences in responses to fasting or modified fasting is sorely lacking. It makes sense to do some experimentation to learn about your own reactions to dietary changes and fasting, but be cautious in the risks you take. As I alluded to above, one issue with a low-insulin diet is that many fruits have a high insulin index. And many fruits weren't tested in time for this list. 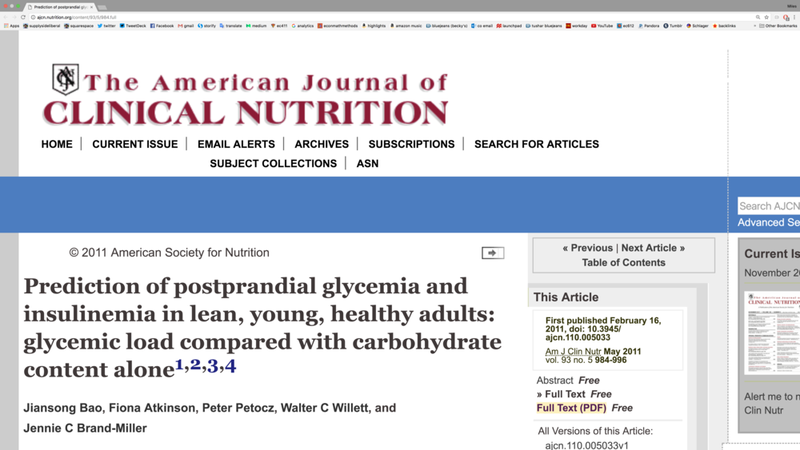 Although there are many important differences, the glycemic index does have a positive correlation with the insulin index. Given the lack of direct data on the insulin index for many fruits, let me report some glycemic indexes for various fruits (mostly from this website). Unlike above, in my list below I put fruits with the lowest glycemic indexes first. Where there is insulin index data, I put that alongside for comparison. Based on this data, for fruits with no direct insulin index data, I would guess the insulin index by multiplying the glycemic index by 1.1. Based on what I know, I have made cream and frozen cherries (or sometimes cherries and half and half) one of my healthy treats. I also love grapefruit. Apricots look like a good way to go as well. I view Pears and apples as fruits that should be eaten only in moderation. I don't have any commercial relationship with this product. Indeed, no one pays me anything for my blog. (I do get paid by Quartz for columns I write there.) But also, all I know about this product is what the advertisements for it say. I figure that taking many kinds of fruit and turning them into a powder that I mix with milk destroys some of the value of the antioxidants, phytochemicals, and other micronutrients, but for me the fact that the sugar has been subtracted in making the powder more than makes up for that. Overall, I feel I am getting an improved ratio of the good aspects of fruit relative to the bad aspects. I do eat some whole fruit (cherries and cream :), but I feel the variety of different fruits that are used to make this powder is valuable because it might give me a wider range of different antioxidants, phytochemicals and other micronutrients. In any case, I wanted to get across the message that, contrary to what you have been taught "fruits and vegetables" are not automatically healthy. Some vegetables—such as carrots, peas, and corn—are relatively starchy, and most fruits have a lot of sugar that weighs down the benefit from their other good aspects. Be just as careful with fruits and vegetables in your efforts to avoid too much fattening insulin production as with other things you eat. If everyone kept handy a table of insulin indexes and treated foods and beverages with high insulin indexes as fattening, and treated foods and beverages with low insulin indexes as good for keeping weight low, it could make a huge difference to health in the US and other countries around the world. This is an area where accurate information alone can do a lot to raise welfare. So spread the word! I hope that soon, many more foods and beverages will be tested for their effects on insulin production by the body, so that an insulin index table will soon be as complete as the calorie tables that I am warning you away from relying on. Let me illustrate how I cope with the current state of the data on the insulin index. I wanted to guess the insulin index for basic hummus (with no added sugar). I first think about the insulin index for related foods like beans and lentils, but that still leaves me confused. Also I wondered whether being mashed up would affect the insulin index (anything that makes digesting something easier, including chopping something or mashing it can raise the insulin index), so I googled "hummus glycemic index" and found that it was 6. Multiplying by 1.1 or a bit more makes me hope insulin index for hummus is about 7, which would mean it was a very good food, suitable even for modified fasts. That is how I would then treat hummus until I found genuine insulin index data for hummus or for the chickpeas hummus is made from. An easier case is cucumbers. Without direct data on the insulin index for any of these, I start out expecting cucumbers to have a bit higher insulin index than lettuce or spinach. To confirm, I googled the glycemic index for cucumbers as 15 (giving me a guess of 17 for the insulin index for cucumbers), but find on the same webpage that spinach and lettuce have the same glycemic index of 15, somewhat higher than I expected. Googling kale glycemic index gets me an estimate of 4 or below for the glycemic index, which further makes me guess an insulin index of 5, which is behind my inclusion of kale in the "suitable for modified fasts" category above. Finally, curious about another ingredient in my daily salad, I googled a glycemic index of 15 for mushrooms. 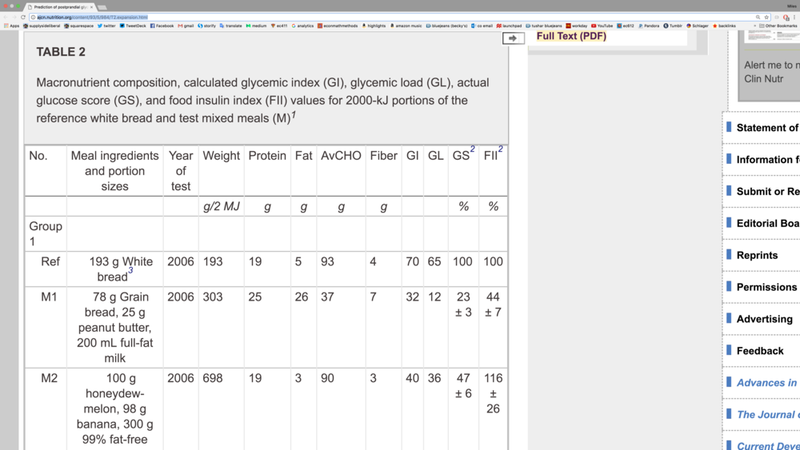 I learned a lot from studying this table of the insulin index for various foods and beverages. I hope you have learned something from my take on that table. Finally, let me emphasize again: please read "Obesity Is Always and Everywhere an Insulin Phenomenon" if you haven't already. That is where I explain why insulin is so important for anyone who cares about their weight or the many deadly diseases that are highly correlated with weight. Matt: So i don't totally get the fascination with focusing on insulin vs calories in / calories out. If you were to eat a ton of fatty meat, nuts, guacamole etc and low sugar you would still gain weight. I don't think many nutrionists / healthcare professionals would disagree. Would you? What usually happens, however, is that carbs / sugar are insanely cheap and tasteful and ubiquitous now such that way more calories in vs calories out means weight has gone. As well as insulin issues and overconsumption of sugar. I just don't see why you disagree so much with saying yeah it is an calories in vs calories out thing, but primarily caused due to the massive increase in sugar / fast digesting carbs. I think you partially agree to this by saying the problem with calories in / calories out is wrong due to the fact that calories in isn't totally exogenous. In short, I think you are on to something with the importance of sugar, and fast digesting carbs, and the resulting insulin effects, I just think that you miss a good bit by not integrating that with the relatively accepted and common sense calories in / calories out framework. Miles: I totally disagree. If you eat only high-fat food, you just can't get much down. You will be too full. By contrast, people can eat a huge amount of sugary things. Sugar gives you a keen appetite. How many calories you want to eat is governed in a big way by how much insulin is produced. Sugar produces a lot of insulin and makes you read to eat more an hour or two later. Fat by itself makes you not want to eat more. Calories in/calories out talks as if calories in and calories out are exogenous. They aren't. They are governed in a big way by insulin. Matt: The bloomin onion has 1,950 calories, of which 72 are due to sugar, and over 1300 are due to fat... you are telling me that is not fattening and that the fat in tht will be satieting? Or that a wedge salad that has 500 calories, and then the clam chowder that has 400 calories which is mainly fat is filling and won't make you fat? That's crazy....None have substantial refined carbs or "starchy", they all have huge, huge amounts of fat and added fat / frying / oil. Sugar is bad, which seems obvious, and I totally agree. the insulin side you and taube talk about is just way exaggerated. (btw, love your blog, and love your unique economic insights. It probably almost seems like I am trolling you since this is about my fourth comment on this topic, but I have lost and kept off 90 lbs over 4 years ( statistics shows <10 percent of people do this) with primarily a calorie counting philosiphy, and this was emphasized when i did nutrition research before recently going to outback (not a big govt rule guy at all, but them mandating calorie information for larger chains certainly has changed my habits, despite many studies I think showing smaller broad scale change). Just thought I would make what anecdotally and logically seems obvious about added fat (oil / butter / fried etc). Miles: Just avoiding sugar and flour (which is highly correlated with avoiding processed foods) will do an enormous amount of good. So if you are getting that right, I am not surprised you are having a lot of success. Yes, I do think that it is better to focus on the effects of food and drink on insulin than on calories, which implies that avoiding avoiding dietary fat is not helpful (unless you are substituting food with an even lower insulin index or are fasting—no food). Think of it this way: many American adults gain about 1 pound a year. One pound of body fat corresponds to about 3500 calories. That means 1 pound a year is slightly less than 10 calories a day. So someone gaining 1 pound a year is keeping the calories in/calories out balance on average within 10 calories per day out of, say, 2000 calories a day overall. That is a remarkably close match! It is clear that people are not doing this consciously. So there must be unconscious regulatory mechanisms that are keeping calories in and calories out in very close balance. If those regulatory mechanisms get off by even 10 calories a day, it leads to being overweight in a now typical way. If those regulatory mechanisms get off by 30 calories a day, it can lead to serious obesity. So it is the regulatory mechanism you should pay attention to, and keeping it on track. The regulatory mechanism will handle the calories in/calories out for you. And insulin is central to the regulatory mechanism. Bread and butter: It is the bread you need to worry about, not the butter. Pizza: It is the dough and the sugar in the toppings you need to worry about, not the cheese. Hamburger: It is the bun you need to worry about, not the meat. Ice Cream: It is the sugar (or nonsugar sweeteners) and corn syrup you need to worry about, not the cream. Note: If you find the title of this post puzzling, take a look at the Wikipedia article for "It's the economy, stupid." While skim milk is high on the insulin index, whole milk is not. While some types of beans are high on the insulin index, other types of beans are reasonably low on the insulin index. While I suspect typical American spaghetti is indeed quite bad, existing evidence on the insulin index suggests (surprisingly) that there may be some types of pasta that are not so bad. More research is needed on this. It is only raw carrots that are OK. Cooked carrots have a higher glycemic index, suggesting a high insulin index. Potatoes should be on the banned list. Which Nonsugar Sweeteners are OK?